There's a particular six toed Hemingway Cat that visits this particular house every day. The cat adopted the person who lives here and comes and goes as it pleases. In this case, it seems to have taken up residence on the porch, behind two small fences, a bicycle wheel and a Bougainvillea in a pot to have the best view of a wandering photographer. It also is a bashful cat and wouldn't stay put for very long. 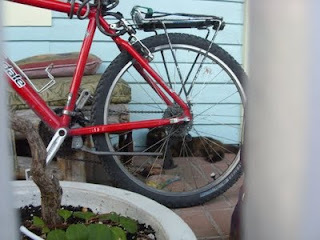 I did manage to get this one shot off before it left tying together in one small area some things that you see everywhere in the Keys - Cats with an extra toe, bicycles, and tropical foliage everywhere.